(1) 福西美香, 松本　太, 佐藤祐一,一浴法および二浴法によって作製されたCu/Niナノオーダー多層めっき膜の耐摩耗性, 表面技術, 62(12), 681-685 (2011). (2) Futoshi Matsumoto, Ethanol and Methanol Oxidation Activity of PtPb, PtBi, and PtBi2 Intermetallic Compounds in Alkaline Media, Electrochemistry, 80(3), 132-138 (2012). (3) Masaru Abe, Futoshi Matsumoto, Miwa Saito, Hiroshi Yamamura, Genki Kobayashi, Atsushi Ito, Takashi Sanada, Masaharu Hatano, Yasuhiko Ohsawa, and Yuichi Sato Activation of a Li-Rich Solid-Solution Layered Li[Ni0.18Li0.20Co0.03Mn0.58]O2 Cathode and Retention of High Capacities via an Electrochemical Pretreatment with a Low Discharge Voltage Limit, Chemistry. Letters, 41(4), 418-419 (2012). (4) Akihiro WATANABE, Futoshi MATSUMOTO, Mika FUKUNISHI, Genki KOBAYASHI, Atsushi ITO, Masaharu HATANO, Yasuhiko OHSAWA, and Yuichi SATO, Relationship between Electrochemical Pre-Treatment and Cycle Performance of a Li-Rich Solid-Solution Layered Li1[Ni0.18Li0.20Co0.03Mn0.58]O2 Cathode for Li-Ion Secondary Batteries, Electrochemistry, 80(8), 561-565 (2012). (5) 木村元彦, 井澤圭介, 福西美香, 小林玄器, 佐藤祐一, 松本　太, 多層Cu/Ni電気めっき膜の耐摩耗性に及ぼすCu-Sn-Ni境界層の効果, 表面技術, 63(12),769-771 (2012). (6) Govindachetty Saravanan, Kazuya Nanba, Genki Kobayashi, and Futoshi Matsumoto, Leaching Tolerance of Anodic Pt-based Intermetallic Catalysts for Formic Acid Oxidation, Electrochim. Acta, 99, 15-21 (2013). (7) Francis M. Auxilia, Toyokazu Tanabe, Shinsuke Ishihara, Govindachetty Saravanan, Gubbala V. Ramesh, Futoshi Matsumoto, Xu Ya, Katsuhiko Ariga, Arivuoli Dakshanamoorthy, Hideki Abe, Interleaved Mesoporous Copper for the Anode Catalysis in Direct Ammonium Borane Fuel Cells, Journal of Nanoscience and Nanotechnology, 14, 4443-4448 (2014). (8) 井澤圭介, 金子信悟, 持田由幸, Govindachetty Saravanan, Arockiam John Jeevagan, 小林玄器, 佐藤祐一, 松本 太, Ni/Cu多層膜の断面観察と耐摩耗性の膜厚依存性, 表面技術, 64(11), 605-607 (2013). (9) Ramesh, Gubbala, kodiyath, Rajesh, Tanabe, Toyokazu, Fujita, Takeshi, Matsumoto, Futoshi, Ishihara, Shinsuke, Ueda, Shigenori, Yamashita, Yoshiyuki, Ariga, Katsuhiko, Abe, Hideki, Pt3Nb Intermetallic Nanoparticles: Highly Stable and CO Tolerant Anode Electrocatalyst for the Oxidation of Ethanol and Formic Acid, ChemElectroChem, 1(4), 728-732(2014). (10) Takao Gunji, Govindachetty Saravanan, Toyokazu Tanabe, Takashi Tsuda, Masahiro, Miyauchi, Genki Kobayashi, Hideki Abe and Futoshi Matsumoto, Long-term Stable Oxygen-Reduction Performance of Titania-supported PtPb Nanoparticles, Catalysis Science and Technology, 4, 1436-1445, (2014). (11) Shingo KANEKO, Bingbo XIA, Qian ZHANG, Guoqing FANG, Weiwei LIU, Hongdan SUN, Futoshi MATSUMOTO, Yuichi SATO, Junwei ZHENG, and Decheng LI, High-Rate Capability of Lithium-Rich Layered Li1.2Ni0.18Mn0.59Co0.03O2 Cathode Material Prepared from Size-Regulated Precursor Fine Particles, Electrochemistry, 82(6), 438-443(2014). (12) Nor A. Fadil, Govindachetty Saravanan, Gubbala V. Ramesh, Futoshi Matsumoto, Hideki Yoshikawa, Shigenori Ueda, Toyokazu Tanabe, Toru Hara, Shinsuke Ishihara, Hideyuki Murakami, Katsuhiko Ariga, and Hideki Abe, Synthesis and Electrocatalytic Performance of Atomically Ordered Nickel Carbide (Ni3C) Nanoparticles, Chem.Comm., 50, 6451-6453 (2014). (13) Takao Gunji, Takashi Tsuda, Arockiam John Jeevagan, Masanari Hashimoto, Toyokazu Tanabe, Shingo Kaneko, Masahiro Miyauchi, Govindachetty Saravanan, Hideki Abe, Futoshi Matsumoto, Visible Light Induced Decomposition of Organic Compounds on WO3 Loaded PtPb Cocatalysts, Catalysis Communications, 56, 96-100 (2014). (14) Takao Gunji, Toyokazu Tanabe, Arockiam John Jeevagan, Sho Usui, Takashi Tsuda, Shingo Kaneko, Govindachetty Saravanan, Hideki Abe, Futoshi Matsumoto, Facile Route for the Preparation of Ordered Intermetallic Pt3Pb-PtPb Core-Shell Nanoparticles and Its Enhanced Activity for Alkaline Methanol and Ethanol Oxidation, J. Power Sources, 273, 990-998(2014). structure and CO-oxidation activity of Pt alloys, Phys. Chem. Chem. Phys., 17, 4879-4887 (2015). (16) Takao Gunji, Keisuke Sakai, Yukiko Suzuki, Shingo Kaneko, Toyokazu Tanabe and Futoshi Matsumoto, Enhanced Oxygen Reduction Reaction on PtPb Ordered Intermetallic Nanoparticle/TiO2/Carbon Black in Acidic Aqueous Solutions, Catalysis Communications, 61, 1-5 (2015). (17) Takao Gunji, Toyokazu Tanabe, Govindachetty Saravanan, Shingo Kaneko, Hideki Yoshikawa, Yoshitaka Matsushita, Nobuaki Sekido, Ya Xu, Shigenori Ueda, Hideki Abe and Futoshi Matsumoto, Enhanced activity for oxygen reduction reactions by carbon-supported high-index-facet Pt-Ti nanoparticles, Electrochemistry, 83(1), 7-11 (2015). (18) 藤井大地， 方 雪琴, 郡司貴雄, 金子信悟,　田邉豊和, 松本 太, イオン液体から成膜されたアルミニウム電気めっき膜の陽極酸化によるポーラスアルミナの形成，表面技術, 66(4), 153-157(2015). (19) 田邉豊和, 伊藤拳人, 森田千絵, 金子信悟, 郡司貴雄, 松本 太, 多重定電流パルスによって作製したNi/Cu電気めっき多層膜におけるNi及びCu層の結晶構造の耐摩耗性への影響, Electrochemistry, 83(8), 624-629(2015). (20) Takao Gunji, Arockiam John Jeevagan, Masanari Hashimoto, Toshiaki Nozawa, Toyokazu Tanabe, Shingo Kaneko, Masahiro Miyauchi and Futoshi Matsumoto，Photocatalytic Decomposition of Various Organic Compounds Over WO3-Supported Ordered Intermetallic PtPb co-Catalysts，Applied Catalysis B: Environmental, 181, 475-480 (2016). (21)　金子信悟，横溝美衣子，望月康正，嵐田敏彦，笹元貴弘，田邉豊和，松本 太，マグネトロンスパッタ法により作製したリン酸リチウムオキシナイ トライド 固体電解質薄膜のイオン伝導性に及ぼす導入ガス中窒素濃度の影響，表面技術, 66(11), 540-543 (2015). (22) 方　雪琴, 上原一真, 金子信悟,　佐藤静夏,　田邉豊和,　郡司貴雄, 松本 太, 塩化アルミニウム/1-エチル-3-メチルイミダゾリウムクロリド/トルエン浴からの光沢性を有するアルミニウム電気めっき膜の作製における添加剤の影響, Electrochemistry, 84 (1) 17-24 (2015). (23) Fuma Ando, Takao Gunji, Hikaru Fujima, Tsuyoshi Takeda, Toyokazu Tanabe, Shingo Kaneko, Futoshi Matsumoto, Preparation of PtPb/TiO2/Cup-Stacked Carbon Nanotube Composite for Enhancement of Electrocatalytic Reaction of Oxygen Reduction Reaction, Chem Lett., 44(12), 1741-1743(2015). (24) Genki Kobayashi, Yuta Irii, Futoshi Matsumoto, Atsushi Ito, Yasuhiko Ohsawa, Shinji Yamamoto, Yitao Cui, Jin-Young Son, Yuichi Sato, Improving Cycling Performance of Li[Li0.2Ni0.18Co0.03Mn0.58]O2 through Combination of Al2O3-based Surface Modification and Stepwise Pre-cycling, J. Power Sources, 303, 250-256(2016). (25) K.Notake, T. Gunji, S. Kosemura, Y. Mochizuki, T. Tanabe, S. Kaneko, S. Ugawa, H. Lee, F. Matsumoto, The Application of a Water-Based Hybrid Polymer Binder to a High-Voltage and High-Capacity Li-rich Solid-Solution Cathode and Its Performance in Li-Ion Batteries, J. Appl. Electrochem., 46(3), 267-278 (2016). (26) A.J. Jeevagan, T. Gunji, F. Ando, T. Tanabe, S. Kaneko, F. Matsumoto, Enhancement of the Electrocatalytic Oxygen Reduction Reaction on Pd3Pb Ordered Intermetallic Catalyst in Alkaline Aqueous Solutions, J. Appl. Electrochem., 46, 745-753 (2016). (27) T. Tanabe, M. Hashimoto, K. Mibu, T. Tanikawa, T. Gunji, S. Kaneko, H. Abe, M. Miyauchi, F. Matsumoto, Synthesis of single phase Sn3O4: native visible-light-sensitive photocatalyst with high photocatalytic performance for hydrogen evolution, Journal of Nanoscience and Nanotechnology, 17(5), 3454-3459 (2017). (28) T. Tanabe, W. Miyazawa, T. Gunji, M. Hashimoto, S. Kaneko, T. Nozawa, M. Miyauchi, F. Matsumoto, Site-selective deposition of binary Pt-Pb alloy nanoparticles on TiO2 nanorod for acetic acid oxidative decomposition, J. Catal., 340, 276-286 (2016). (29) Kazuma Uehara, Keitaro Yamazaki, Takao Gunji, Shingo Kaneko, Toyokazu Tanabe, Takeo Ohsaka, Futoshi Matsumoto, Evaluation of Key Factors for Preparing High Brightness Surfaces of Aluminum Films Electrodeposited from AlCl3-1-Ethyl-3-Methylimidazolium Chloride-Organic Additive Baths, Electrochimica Acta, 215, 556–565 (2016). (30) Toyokazu Tanabe, Takao Gunji, Youhei Honma, Koki Miyamoto, Takashi Tsuda, Yasumasa Mochizuki, Shingo Kaneko, Shinsaku Ugawa, Hojin Lee, Takeo Ohsaka, Futoshi Matsumoto, Preparation of Water-Resistant Surface Coated High-Voltage LiNi0.5Mn1.5O4 Cathode and Its Cathode Performance to Apply a Water-Based Hybrid Polymer Binder to Li-Ion Batteries, Electrochimica Acta, 224, 429-438 (2017). (31) 田邉豊和, 川崎大樹, 金子信悟, 郡司貴雄, 松本 太, 電流パルスめっき法を用いて作製したNi/CuおよびNi/Ni-P多層膜の断面観察と耐摩耗性の膜厚依存性, 表面技術, 68(4) 213-218 (2017). (32) 津田 喬史, 井波祐貴, 中村亮介, 安藤風馬, 望月康正, 郡司貴雄, 田邉豊和, 金子信悟, 板垣薫, 杣直彦, 松本 太, 積層型グラファイト/穴あき集電箔負極における集電箔上の開口条件および反応温度と Li+イオンプレドープ速度との関係, Electrochemistry, 85(4) 186-194 (2017). (33) Fuma Ando, Toyokazu Tanabe, Takao Gunji, Takashi Tsuda, Shingo Kaneko, Tsuyoshi Takeda, Takeo Ohsaka, Futoshi Matsumoto, Improvement of ORR Activity and Durability of Pt Electrocatalyst Nanoparticles Anchored on TiO2/Cup-Stacked Carbon Nanotube in Acidic Aqueous Media, Electrochimica Acta, 232, 404-413(2017). (34) Gunji, Takao; Noh, Seung Hyo; Tanabe, Toyokazu; Han, Byungchan; Nien, Chiao Yin ; Ohsaka, Takeo; Matsumoto, Futoshi, An Enhanced Electrocatalytic Activity of Carbon-Supported Ordered Intermetallic Palladium-Lead (Pd3Pb) Nanoparticles towards Electrooxidation of Formic Acid, Chemistry of Materials, 129(7), 2906-2913 (2017). (35) 津田喬史, 安東信雄, 郡司貴雄, 田邉豊和, 金子信悟, 板垣 薫, 杣直彦, 中村 奨, 松本 太, 穴あきLiFePO4 /活性炭ハイブリッド電極構造によるLiFePO4正極の高出力化, Electrochemistry, 85(8),447-450 (2017). (36) Z. Zhang, S. Ishikawa, M. Kikuchi, H. Yoshikawa, Q. Lian, H. Wang, T. Ina, A. Yoshida, M. Sadakane, F. Matsumoto, W. Ueda, High-Performance Cathode Based on Microporous Mo−V−Bi Oxide for Li Battery and Investigation by Operando X-ray Absorption Fine Structure, ACS Appl. Mater. Interfaces, 9, 26052−26059 (2017). (37) Zhu, Qianqian; Zhang, Zhenxin; Sadakane, Masahiro; Matsumoto, Futoshi; Hiyoshi, Norihito; Yamamoto, Akira; Yoshida, Hisao; Akihiro; Hara, Michikazu; Ueda, Wataru, Structural Characterization of 2D Zirconomolybdate by Atomic Scale HAADF "Structural Characterization of 2D Zirconomolybdate by Atomic Scale HAADF and XANES its Highly Stable Electrochemical Properties as a Li Battery Cathode, Inorganic Chemistry, 56, 14306-14314 (2017). (38) 津田喬史, 安東信雄, 三橋直人, 田邉豊和, 板垣薫, 杣直彦, 中村 奨, 林 成実, 松本 太, 穴あきグラファイト電極積層セルのLi+イオンプレドープにおける電極開口条件および反応温度とプレドープ速度との関係, Electrochemistry, 86(1) 10-18 (2018). (39) T. Tanabe, Y.B. Liu, K. Miyamoto, Y. Irii, F. Maki, Fumihiko Maki, T. Gunji, S. Kaneko, S. Ugawa, H. Lee, T. Ohsaka, F. Matsumoto, Synthesis of Water-Resistant Thin TiOx Layer-Coated High-Voltage and High-Capacity iLiNiaCo bAl 1-a-bO2 (a > 0. > 0.85 ) Cathodeand Its Cathode Performance to Apply a Water-Based Hybrid Polymer Binder Binder to Li -Ion Batteries, Electrochimica Acta, 258, 1348-1355 (2017). (40) F. Nomura Y. Liu, T. Tanabe, N. Tamura, T. Tsuda, T. Hagiwara, T. Gunji, T. Ohsaka, F. Matsumoto, Optimization of Calcination Temperature in Preparation of a High Capacity Li-rich Solid-Solution Li[Li0.2Ni 0.18Co0.03Mn0.58]O2 Material and Its Cathode Performance in Lithium Ion Battery,Electrochimica Acta, 269, 321-330 (2018). (41) Fuma Ando, Toyokazu Tanabe, Takao Gunji, Shingo Kaneko, Tsuyoshi Takeda, Takeo Ohsaka, Futoshi Matsumoto, Effect of the d-Band Center on the Oxygen Reduction Reaction Activity of Electrochemically Dealloyed Ordered Intermetallic Platinum-Lead (PtPb) Nanoparticles Supported on TiO2-Deposited Cup-Stacked Carbon Nanotubes, ACS Applied Nano Materials, 1(6) 2844-2850 (2018). (42) Takao Gunji, Ryo H. Wakabayashi, Seung Hyo Noh, Byungchan Han, Futosh Matsumoto, Francis J. DiSalvo, Héctor D. Abruña, The Effect of Alloying of Transition Metals (M = Fe, Co, Ni) with Palladium Catalysts on the Electrocatalytic Activity for the Oxyge Reduction Reaction in Alkaline Media, Electrochimica Acta, 283, 1045-1052 (2018). (43) Fumihiro Nomura, Yubin Liu, Toyokazu Tanabe, Takao Gunji, Takashi Tsuda, Shinsaku Ugawa, Hojin Lee, Takeo Ohsaka, Futoshi Matsumoto, Elucidation of Key Factors of Water-Resistance of Li-Rich Solid-Solution Layered Oxide Cathode Materials Applicable to a Water-Based Cathode Preparation Process for Li-Ion Battery, Electrochimica Acta, 283, 478-487 (2018). (44) Takao Gunji, Seung Hyo Noh, Fuma Ando, Toyokazu Tanabe, Byungchan Han, Takeo Ohsaka, Futoshi Matsumoto, Electrocatalytic Activity of Structurally Ordered Intermetallic PdCu3 Nanoparticles towards Oxygen Reduction Reaction in Acidic Media, Journal of Materials Chemistry A, 6, 14828-14837 (2018). (45) Takashi Tsuda, Nobuo Ando, Kazuki Matsubara, Toyokazu Tanabe, Kaoru Itagaki, Naohiko Soma, Susumu Nakamura, Narumi Hayashi, Takao Gunji, Takeo Ohsaka b, Futoshi Matsumoto, Improvement of high-rate charging/discharging performance of a lithium ion battery composed of laminated LiFePO4 cathodes/ graphite anodes having porous electrode structures fabricated with a pico-second pulsed laser, Electrochimica Acta, 291, 267-277 (2018). (46) Takashi Tsuda, Nobuo Ando, Susumu Nakamura, Yuuta Ishihara, Narumi Hayashi, Naohiko Soma, Takao Gunji, Toyokazu Tanabe, Takeo Ohsaka, Futoshi Matsumoto, Improvement of high-rate discharging performance of LiFePO4 cathodes by forming micrometer-sized through-holed electrode structures with a pico-second pulsed laser, Electrochimica Acta, 296, 27-38 (2018). (47) Yubin Liu, Toyokazu Tanabe, Yuta Irii, Fumihiko Maki, Takashi Tsuda, Takao Gunji, Shinsaku Ugawa, Yuta Asai, Hojin Lee, Takeo Ohsaka, Futoshi Matsumoto, Optimization of Synthesis Condition of Water-Resistant and Thin Titanium Oxide Layer-Coated Ni-rich Layered Cathode Materials and Their Cathode Performance, J. Applied Electrochemistry, 49(1), 99-110 (2019). (48) Takashi Tsuda, Nobuo Ando, Tomohiro Utaka, Kenji Kojima, Susumu Nakamura, Narumi Hayashi, Naohiko Soma, Takao Gunji, Toyokazu Tanabe, Takeo Ohsaka, Futoshi Matsumoto, Improvement of High-Rate Performance of LiFePO4 Cathode with Through-Holed LiFePO4/Activated Carbon Hybrid Electrode Structure Fabricated with a Pico-second Pulsed Laser, Electrochimica Acta, 298, 827-834 (2019). (49) Tsukasa Watanabe, Yuta Inafune, Manabu Tanaka, Yasumasa Mochizuki, Futoshi Matsumoto, Hiroyoshi Kawakami, Development of all-solid-state battery based on lithium ion conductive polymer nanofiber framework, J. Power Sources, 423, 255-262 (2019). (1) 佐藤祐一, 松本 太, 伊藤淳史, 大澤康彦, 分担部分：固溶体系正極材料の高容量化と充放電サイクル特性の向上, 書籍名：リチウム二次電池の車載技術、劣化・トラブル要因とその対策 〜高容量・高出力・長寿命・低コスト・高安全化／精度の高い評価・解析技術〜, 技術情報協会(2011年７月). (6) 松本　太，Govindachetty Saravanan, 第４節- ギ酸燃料極における電極触媒酸化反応の機構解析のための交流インピーダンス測定,「電気化学/インピーダンス測定のノウハウと正しいデータの解釈」，技術情報協会編，p. 386-389. (8) 松本　太, 郡司貴雄, 金子信悟, 渡辺充広, 村上　更, 粗面化アルミニウム集電体を用いたリチウム二次電池用 正極/水系バインダー薄膜の作製と性能評価, 「LiBの高容量・高耐久化のための電極-電解液（質）の界面制御技術と解析・評価法」, 技術情報協会編，p.100-105. (9) 金子信悟, 松本　太, 佐藤祐一, 李　徳成, 界面化学的手法によって調製したサイズ制御前駆体に基づく リチウム過剰層状正極材料の合成, 「LiBの高容量・高耐久化のための電極-電解液（質）の界面制御技術と解析・評価法」, 技術情報協会編，p. 55-60. (10) 大坂　武男, 岡島　武義, 松本　太, 北村　房男　(共訳), 「電気化学　基礎と応用」, 東京化学同人，ISBN 9784807908479 (2015). 電極活物質スラリーの調整と電池特性への影響の解析，第七節，「粉体，微粒子分析テクニック事例集」 , 技術情報協会編，p. 310-311 (2015). (12) 田邉豊和, 松本　太, 鵜川普作, 「次世代電池用 電極 材料 の高エネルギ ー密度、 高出力化」　水系バインダーの高電圧・高容量リチウム過剰系正極への適用と充放電特性, 技術情報協会編，p. 70-75 (2017). (13) 津田喬史, 松本 太, 中村 奨, 「リチウムイオン電池における高容量化・高電圧化技術と安全対策」，第二章第七節　穴あき加工LiFePO4/活性炭電極を用いたLIB の高出力化，技術情報協会編 (2018). (14) 野村文洋, 津田喬史, 松本 太,「リチウムイオンリチウムイオン電池における高容量化・高電圧化技術と安全対策」，第二章第八節　リチウム過剰系固溶体正極材料 xLi2MnO3-yLiNi1/2Mn1/2O2-(1-x-y)LiNi1/3Co1/3Mn1/3O2の電池性能と組成 の関係の検討，技術情報協会編 (2018). (15) 郡司貴雄, 松本　太, 入井友海太, 高容量正極LiNiaCobAlcO2(a>0.85)の水系バインダーへの適用のための表面コーティング, 『リチウムイオン電池用添加剤の開発と市場』 , シーエムシー出版, 71-78 (2018). (16) 郡司貴雄, 安藤風馬, 松本　太, 第５節　回転電極を用いたボルタンメトリー法の原理、測定方法と注意点, 「電気化学測定のノウハウとデータ解析手法」, 技術情報協会編，42-49 (2018). (3) 「METHOD FOR PRE-PROCESSING LITHIUM ION SECONDARY BATTERY」, 国際公開番号WO/2012/124602, 国際出願番号PCT/JP2012/055975. (7) 「Positive electrode active material containing solid solution active material, positive electrode containing said positive electrode active material, and nonaqueous electrolyte secondary battery using said positive electrode」, US 2016/0118649 A1, 14798085.8-1359 PCT/J2014062434. (1) 郡司貴雄, 田邉豊和, 松本 太, 金属間化合物ナノ粒子の電極触媒としての固体高分子形燃料電池への適用, Acc. Mater. Surf. Res., 2(3), 89-100 (2017). (2) Takao Gunji, Futoshi Matsumoto, Electrocatalytic Activities of Bimetallic, Trimetallic, and Core-Shell-Structured Pd-based Materials, Inorganics,7, 36 (2019). (1) Futoshi Matsumoto, Govindachetty Saravanan, Genki Kobayashi, “APPLICATION OF ORDERED INTERMETALLIC PHASES TO ELECTROCATALYSIS”, ECS Transactions, Electrochemical Society, Inc., 50(36), 3-8 (2013). (2) Arockiam John Jeevagan, Takao Gunji, Naoyuki Sawano, Govindachetty Saravanan, Taiki Kojima, Shingo Kaneko, Genki Kobayashi, Futoshi Matsumoto, “Two-Step Microwave Synthesis of Highly Dispersed Ordered Intermetallic PtPb Nanoparticles On Carbon Black”, ECS Transactions, Electrochemical Society, Inc., 58(21), 25-31(2014). (3) Arockiam John Jeevagan, Yukiko Suzuki, Takao Gunji, Govindachetty Saravanan, Yuta Irii, Takashi Tsuda, Toshiaki Onobuchi, Shingo Kaneko, Genki Kobayashi, Futoshi Matsumoto, "Electrocatalytic Oxygen Reduction and Water-Oxidation on Transition Metal Ion-Doped MnO2, RuO2 and IrO2 in Alkaline Aqueous Solutions", ECS Transactions, Electrochemical Society, Inc., 58(20), 9-18 (2014). (4) Toshiyuki Wakao, Takao Gunji, Arockiam John Jeevagan,Yasumasa Mochizuki, Shingo Kaneko, Kunihito Baba, Mitsuhiro Watanabe, Yusuke Kanda, Koh Murakami, Masaya Omura, Genki Kobayashi, Futoshi Matsumoto, Stable Charge/Discharge Cycle Performance of a LiFePO4 Cathode Prepared with a Carboxymethyl Cellulose Binder, ECS Transactions, Electrochemical Society, Inc., 58 (25),19-25 (2014). (5) Takao Gunji, Takashi Tsuda, Arockiam John Jeevagan, Masanari Hashimoto, Shingo Kaneko, Toyokazu Tanabe, and Futoshi Matsumoto, Site-Selective Deposition of Ordered Intermetallic PtPb Nanoparticle Co-Catalysts on WO3 Surfaces to Enhance Photocatalytic Activity, ECS Transactions, Electrochemical Society, Inc., 61(22), 55-59 (2014). (6) Masanari Hashimoto, Takao Gunji, Arockiam John Jeevagan, Toyokazu Tanabe, Takashi Tsuda, Shingo Kaneko, Masahiro Miyauchi and Futoshi Matsumoto, Photocatalytic Activity of Pt3Ti/WO3 Photocatalyst under Visible-Light Irradiation, ECS Transactions, Electrochemical Society, Inc., 61(26), 17-22 (2014). (7) Arockiam John Jeevagan, Takao Gunji, Toyokazu Tanabe, Shingo Kaneko, Futoshi Matsumoto, "Photocatalytic Activity of Pd-Au Alloy Nanoparticle Co-Catalyst/TiO2 for Acetic Acid Decomposition", ECS Transactions, Electrochemical Society, Inc., 64(25),9-16 (2015). (8) T. Gunji, K. Sasaki, A. J. Jeevagan, T. Tanabe, S. Kaneko, F. Matsumoto, Enhanced Oxygen Reduction Reactions and Stable Long-term Activity on TiO2-supported Dealloyed PtCu Nanoparticles in Acidic Aqueous Solutions, ECS Transactions, Electrochemical Society, Inc., 66(39),1-8 (2015). (9) Takuya Kuzuoka, Tomohiro Kouno, Tomohiro Koyama, Yuji Morita, Keitaro Yamazaki, Takao Gunji, Toyokazu Tanabe, Shingo Kaneko, Ben Nanzai, Futoshi Matsumoto, Development of Moving Micro-Machines That Use Hydrogen Peroxide and Glucose as Fuels, ECS Transactions, Electrochemical Society, Inc., 69(39),17-26 (2015). (10) Takao Gunji, Masanari Hashimoto, Toyokazu Tanabe, Shingo Kaneko, Futoshi Matsumoto, Preparation of Ordered Intermetallic PtBi co-Catalyst Nanoparticles/WO3 and its Photocatalytic Activity towards Decomposition of Acetic Acid, ECS Transactions, Electrochemical Society, Inc., 69(39),11-16 (2015). (11) Kazuma Uehara, Takao Gunji, Toyokazu Tanabe, Shingo Kaneko, Futoshi Matsumoto, The effect of Brightener on the Fabrication of Electroplated Bright Aluminum Films Using an AlCl3-EMIC-Toluene Bath, ECS Transactions, Electrochemical Society, Inc., 69(29),7-13 (2015). (12) Arockiam John Jeevagan, Takao Gunji, Toyokazu Tanabe, Shingo Kaneko, Futoshi Matsumoto, Synthesis of Reduced Graphene Oxide-Supported PtAu Catalysts and Their Electrocatalytic Activity for Formic Acid Oxidation, ECS Transactions, Electrochemical Society, 72 (29), 15-21 (2016). (13) Fuma Ando, Takao Gunji, Toyokazu Tanabe, Shingo Kaneko, Tsuyoshi Takeda, Takeo Ohsaka, Futoshi Matsumoto, Enhancement of the Oxygen Reduction Reaction (ORR) on a PtPb Nanoparticle /TiO2/Cup-stacked Carbon Nanotube Composite in Acidic Aqueous Solutions based on the Electronic Interaction between PtPb and TiO2, ECS Transactions, Electrochemical Society, Inc., 72(33), 53-62 (2016). (14) Takashi Tsuda, Hayato Kokubun, Yuki Asaoka, Koki Miyamoto, Yasumasa Mochizuki, Takao Gunji, Toyokazu Tanabe, Shingo Kaneko,Takeo Ohsaka, Futoshi Matsumoto, Dependences of Discharge Capacity, Retention of Discharge Capacity, Average Discharge Voltage and Energy Density, and Rate Capability on the Composition of xLi2MnO3-yLiNi1/2Mn1/2O2-(1-x-y)LiNi1/3Co1/3Mn1/3O2 Li-rich Solid-Solution Cathode Materials for Li-Ion Battery, ECS Transactions, Electrochemical Society, Inc., 75(20),173-187 (2017). (15) Takashi Tsuda, Nobuo Ando, Naoto Mitsuhashi, Toyokazu Tanabe, Kaoru Itagaki, Naohiko Soma, Susumu Nakamura, Narumi Hayashi, Futoshi Matsumoto, Fabrication of Porous Graphite Anodes with Pico-Second Pulse Laser and Enhancement of Pre-Doping of Li+ Ions to Laminated Graphite Anodes with Micrometre-Sized Holes Formed on the Porous Graphite Anodes, ECS Transactions, Electrochemical Society, Inc., 77(11),1897-1903 (2017). (16) Takashi Tsuda, Nobuo Ando, Naoto Mitsuhashi, Toyokazu Tanabe, Kaoru Itagaki, Naohiko Soma, Susumu Nakamura, Narumi Hayashi, Futoshi Matsumoto, Fabrication of Porous Electrodes with a Picosecond Pulsed Laser and Improvement of the Rate Performance of a Porous Graphite Anode and LiFePO4 Cathode, ECS Transactions, Electrochemical Society, Inc., 80(10) 1391-1397 (2017). (17) Takashi Tsuda, Nobuo Ando, Yusuke Haruki, Toyokazu Tanabe, Takao Gunji, Kaoru Itagaki, Naohiko Soma, Susumu Nakamura, Narumi Hayashi, Futoshi Matsumoto, Study on Li Metal Deposition, SEI Formation on Anodes and Cathode Potential Change during the Pre-Lithiation Process in a Cell Prepared with Laminated Porous Anodes and Cathodes, ECS Transactions, Electrochemical Society, Inc., 85(13) 1507-1515(2018). (18) Fumihiro Nomura , Toyokazu Tanabe , Takao Gunji , Futoshi Matsumoto, Effect of the Cooling Process on the Structure and Charge/Discharge Cycling Performance in Li[Li0.20Mn0.58Ni0.18Co0.04]O2 Li-rich Solid Solution Layered Oxide Cathode Materials for Li-Ion Battery, ECS Transactions, Electrochemical Society, Inc., 85(13) 1497-1505 (2018). (4) Yuichi Sato, Genki Kobayashi, Yuta Irii, Nobuya Kitada, Futoshi Matsumoto, Ryo Ohtsu, Kohei Shibukawa, Atsushi Ito, Shinji Yamamoto, Yasuhiko Ohsawa, ポスター賞 The 64th Annual Meeting of the International Society of Electrochemistry(Santiago de Querétaro, Mexico, 2013.9.8-13), Surface Modification Effect on Electrochemical Performance of Li-rich Layered xLi2MnO3-(1-x)LiMO2. (5) 津田喬史，橋本真成, ポスター賞 ECS 224th meeting(San Francisco, 2013.10.27-31), Synthesis of Intermetallic Nanoparticles as Co-catalyst on Anatase TiO2 and Its Photocatalytic Activity. (9) 郡司 貴雄, 電気化学会　若手研究者の国際交流支援　2015年度. (12) 郡司 貴雄, 表面技術協会第133回講演大会第22回学術奨励講演賞, AlCl3-EMIC イオン液体からのアルミニウム電気めっきにおける添加剤の効果(3) −添加剤の分子構造と光沢性の関係−（2016.3.22). (15) 郡司 貴雄, 研究助成 (2016) 池谷科学技術振興財団. (17) 郡司 貴雄, The 5th International Seminar for Special Doctoral Program "Green Energy Conversion Science and Technology" Poster Award. (20) 安藤風馬, 電気化学会　若手研究者の国際交流支援　2017年度前期. (25) 松本 太 (共同代表者)，"高速クロノポテンショグラムを用いたリチウム二次電池劣化度の機械学習的評価法の開発", フェーズA, 平成29年度「ベンチャー企業等による新エネルギー技術革新支援事業」. (26) 松本 太（連名者），"電極の三次元化やリチウムイオンドーピング技術に向けた連続レーザ穿孔装置の開発", フェーズB, 平成29年度「ベンチャー企業等による新エネルギー技術革新支援事業」. (30) 津田喬史，電気化学会　若手研究者の国際交流支援　2017年度後期 (辞退). (34) Yubin Liu , Student Poster Session Award 1st5 Place -Solid State, ECS 232rd meeting(Washington DC, 2017.10-1-5). (36) 安藤風馬, 第7 回CSJ 化学フェスタ2017, 優秀ポスター発表賞, "固体高分子形燃料電池用酸素還元電極触媒の触媒活性と電極触媒表面の電子状態の関係の解明"
(37) 松本 太（代表），日本私立学校振興・共済事業団　平成30年度　学術研究振興資金　″「可逆的″燃料電池用電極触媒の新展開 -計算化学と実験の融合による新規材料の創製-」. (39) 松本 太（代表），2018年度研究課題目 ：「イオン液体 /有機溶媒混合浴 からの 光沢性を有するアルミニウム電気めっき膜の作製における添加剤の影響及びその めっき膜のバイオ バイオ 応用 」，公益財団法人 高橋産業経済研究財団. (49) 松本 太（連名者），"高速パルスの正規化データを用いるリチウム電池劣度の機械学習的評価法の技術開発 ", フェーズB, 平成30年度「ベンチャー企業等による新エネルギー技術革新支援事業」. (54) 郡司 貴雄, 東電記念財団2018年度研究助成（一般研究）, 耐久性に優れた新規電極触媒の創生. (57) 松本 太（代表），2019年度継続研究課題目 ：「イオン液体 /有機溶媒混合浴 からの 光沢性を有するアルミニウム電気めっき膜の作製における添加剤の影響及びその めっき膜のバイオ バイオ 応用 」，公益財団法人 高橋産業経済研究財団. (1) 松本　太，金子信悟，多層めっき構造の解析や光沢アルミニウムめっきの研究から次世代の新たな材料を探索，アカデミアシリーズ：第55回, 鍍金の世界 12月号(2015). (2) 郡司 貴雄，227th ECS meeting参加報告, 若者の広場, Electrochemistry, 84 (1) 53 (2015). 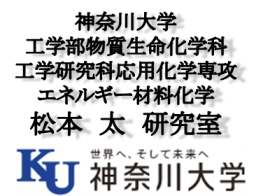 (3) 金子信悟, 66th ISE meeting参加報告, 若者の広場, Electrochemistry, 84 (6) 476 (2016). (4) 田邉豊和, 伊藤拳人, 金子信悟, 郡司貴雄, 大坂　武男, 松本 太, 多重定電流パルスによって作製したNi/Cu 電気めっき多層膜 におけるナノ周期構造と耐摩耗性 , まてりあ第55巻 第 12号特集 601 (2016). (5) 安藤風馬，231th ECS meeting参加報告, 若者の広場, Electrochemistry, 86 (Spring) (2018). (6) 岸岡真也，松本　太, 大坂武男，サイクリックボルタンメトリー(CV)の基礎, Electrochemistry, 86(summer) 138-148 (2018). (7) 松本　太, 巻頭言　「来たバスに乗れ」,　表面技術、70(3), 1 (2019). (8) 渡邉達也, 郡司貴雄, 松本　太, 次世代電池のキーテクノロジーと材料開発(1) 〜電極活物質の表面コーティング、高電位・高容量正極、レーザー加工穴あき電極〜, 電材ジャーナル　第640号 印刷中12-18 (2019). (9) 渡邉達也, 野村文洋, 安藤風馬, 松本　太, 次世代電池のキーテクノロジーと材料開発(2) 〜正・負極用バインダー〜, 電材ジャーナル　第641号 印刷中 (2019). (10) 松本　太、企業・研究所訪問&インタビュ- 中小企業のリチウムイオン電池材料開発を支援-　神奈川大学新型電池オープンラボ　工業材料、p. 1, 2019年2月号. Copyright(C) 2009 ●●●神奈川大学工学部物質生命化学科エネルギー材料化学松本研究室 ●●● All Rights Reserved.